For anyone who regularly visits Taiwan, the city of Tainan can easily be missed with the other three major cites of Taipei, Taichung, and Kaohsiung. Yet that would be a grave mistake if you consider yourself a foodie. A word of warning, driving in Tainan is atrocious – there are only two major roads going into the city off of Highway 1. Yet if you brave the driving conditions and/or decide take the train (HSR or TRA), make your way to the old historic district and you will be pleasantly satiated with all sorts of Taiwanese small eats (台灣小吃). This time we were only in Tainan for half a day so we didn’t get to do as much eating as we liked – but our stomachs were happy nevertheless. Let’s start with the noodles! 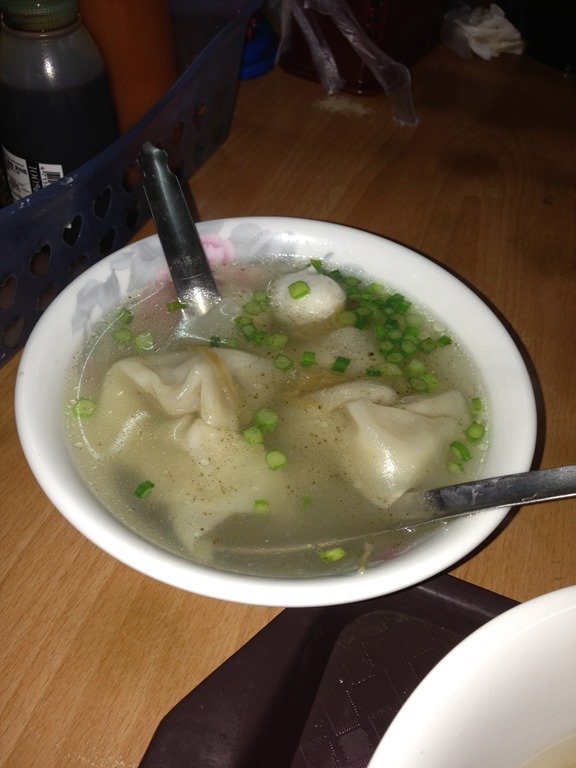 A great place to have noodles / won ton noodle soup is 福榮小吃店 Ramen / Noodle House. 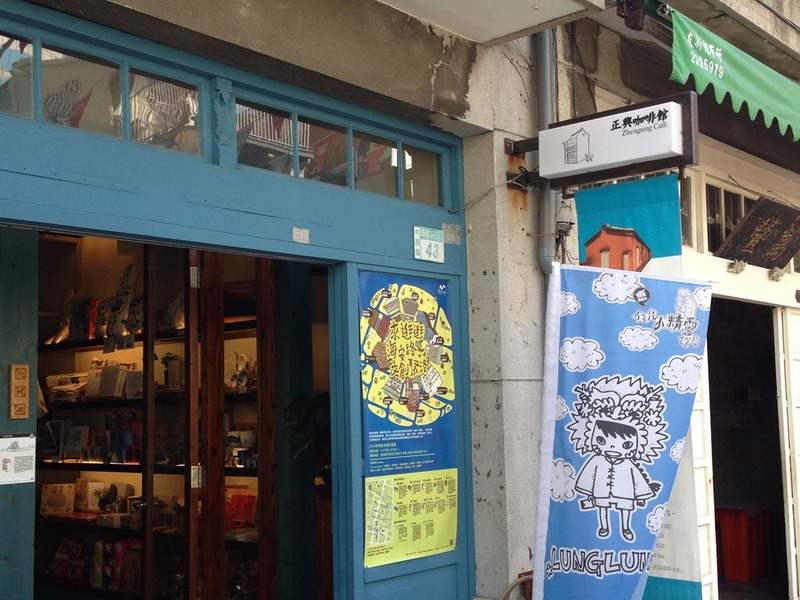 As typical with many great noodle shops in Tainan, this is next to the fabric district full of very small alley ways. 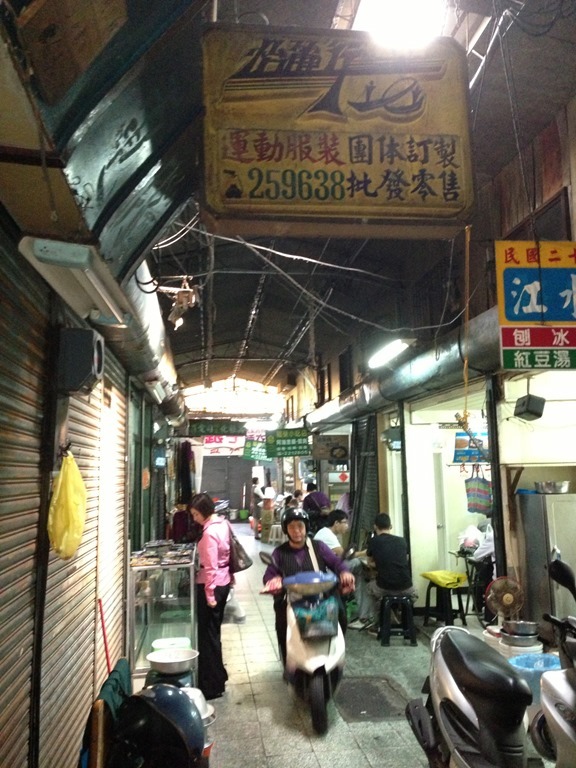 The image to the left is one of the alley ways to get to 福榮小吃店. It’s small, poorly lit, and can barely fit three motor scooters side-by-side together. Yet with scooters buzzing around, lots of noise, and people squeezing past each other – the line up to the shop was long and quite busy. The reason for the patient waiting was because of the amazing noodle / won ton noodle soups this shop serves. The left is dry won ton noodles while the right is won ton soup with fish balls. As typical with many of these food shops, the selection is few because the owners specialize in just a few items. And the items are fresh, handmade, and delicious. 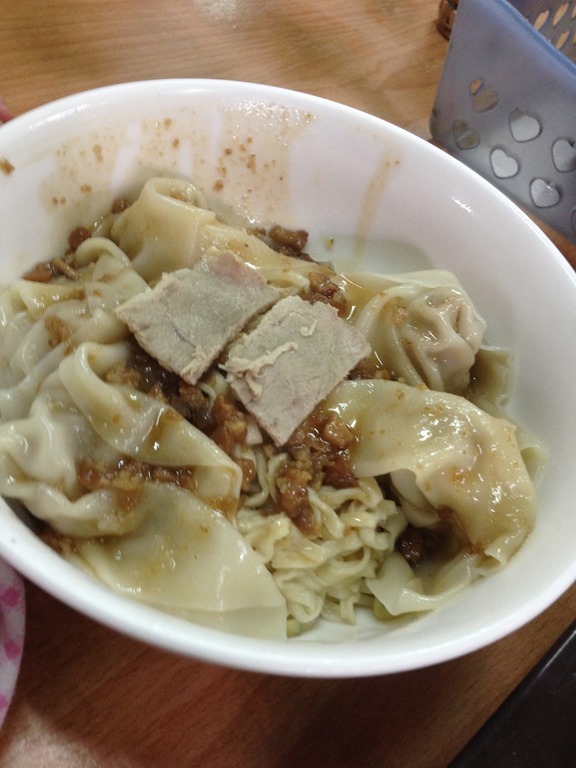 Even better still, the dry won ton noodles was NT$ 45 – which translates to about USD $1.50! The dish seems small yet is quite filling. And in fact I didn’t really want it to be too filling since there are so many other great food shops in the vicinity. Again, an all too short of a visit – enough time to say hi to friends, eat, drink coffee and then we ran off. But what I like about the area is the prevalence of good Italian espressos. If you visit Taiwan enough – you’ll note that there are plenty of coffee shops – and plenty of machines that make espresso-like drinks whether it’s the local 7-11 (which are super popular here in Taiwan) or 85C (local Taiwanese chain that recently expanded to the US). Yet, finding a good espresso can sometimes be a serious chore. And in the district that we were having lunch, there are a lot of old brick houses with wonderful small architectural details. Instead of taking them down and replacing them with modern buildings, many of these houses have been converted into coffee shops and/or mini art galleries that serve coffee (i.e. for Seattlelites, this just means coffee shop). 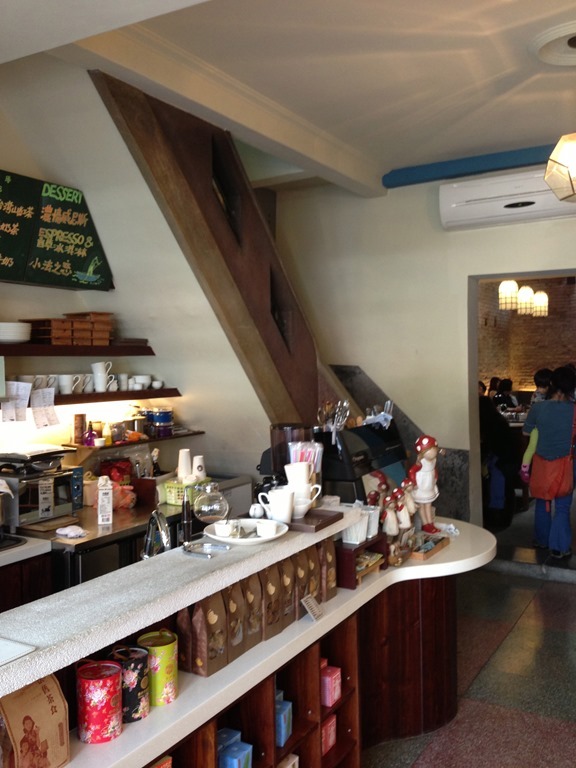 Above is the entrance to 正興咖啡館 Zhengxing Café which has amazing ambience and allowed us to hide away albeit briefly from the hustle and bustle of the Tainan streets. As you can see from the foyer entering into the coffee shop, it’s basically the old front room / living room of the house that has been converted into the barista stand / gift shop. But once you walk into the main seating area – its amazing how quiet and relaxing the coffee shop is. The old brick houses do a wonderful job keeping out the noise and have a nice dampening effect to so people can talk quietly without disturbing their neighbors. 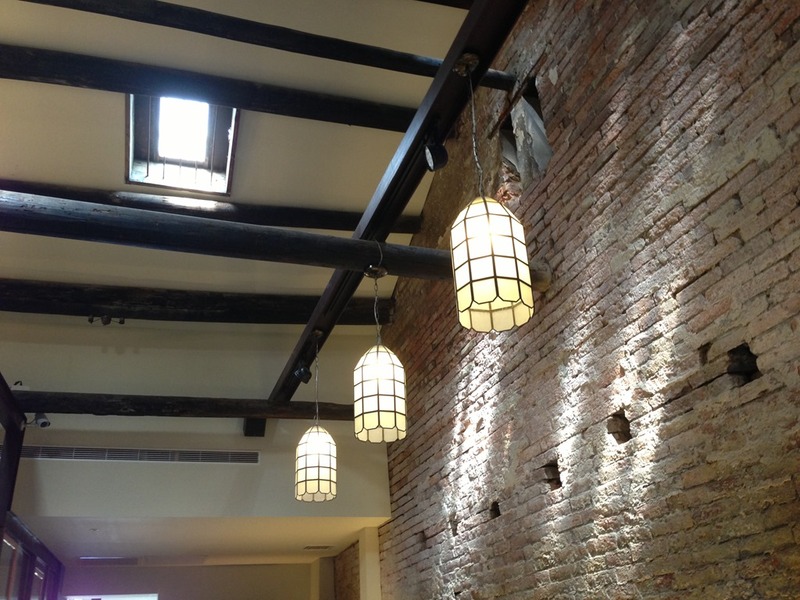 Looking up you can see old architectural features of the house from the bricks themselves to the ceiling beams to the lanterns. What I particularly liked about this particular coffee shop is that it is also a Bed and Breakfast. 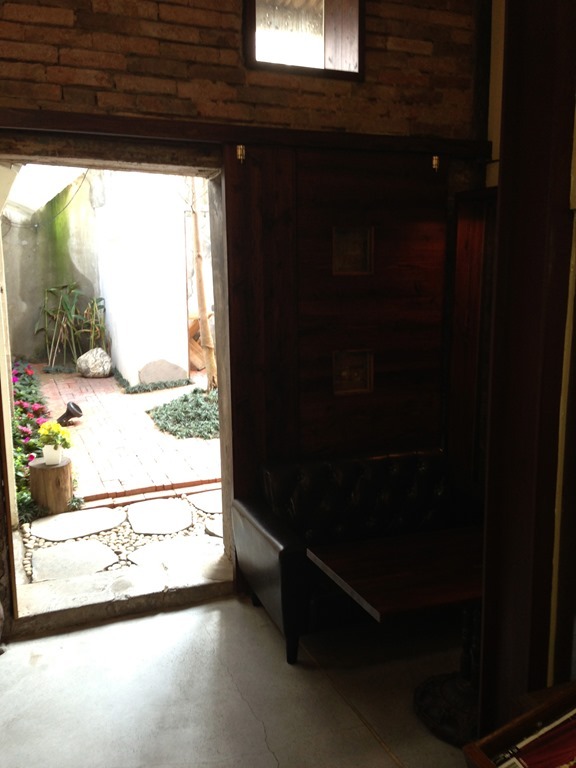 The back door points to a small quaint court yard that is the entrance to your B&B. A small little bit of tranquility in the wonderful chaos of Tainan. There is so much more to this city and this post hardly does it justice. Our visit to Tainan was far too short and we will have to return again – if for no other reason the amazing culinary variety! Taipei Main Train Station has some good eats! Just found a great noodle joint in Oakland’s Chinatown, Ying Kee Noodle House: http://www.yelp.com/biz/ying-kee-noodle-house-oakland. Most dishes are about $6.50 with some costing up to $6.99. Sweet! It’s been awhile since I was in Oakland – usually just get to SF and then never leave – will have to make a trip to try it out, eh?! “San Francisco Magazine” ran “The Great Noodle Quest” as its cover story last month with this deck “Spurred by the ongoing ramen craze, noodles of all nationalities are hotter than a steaming bowl of tonkotsu. But how do you separate the meritorious from the mediocre? You slurp—a lot. Asian food connoisseur Jonathan Kauffman hunts down The Bay Area’s 21 Top Bowls.” Link: http://w.sanfranmag.com/san-francisco/story/the-great-noodle-quest. Some are in the East Bay. Enjoy on your next trip south. Wow! This is a great resource – thanks a bunch! Will definitely try these out when I’m back in the Bay Area, eh? !